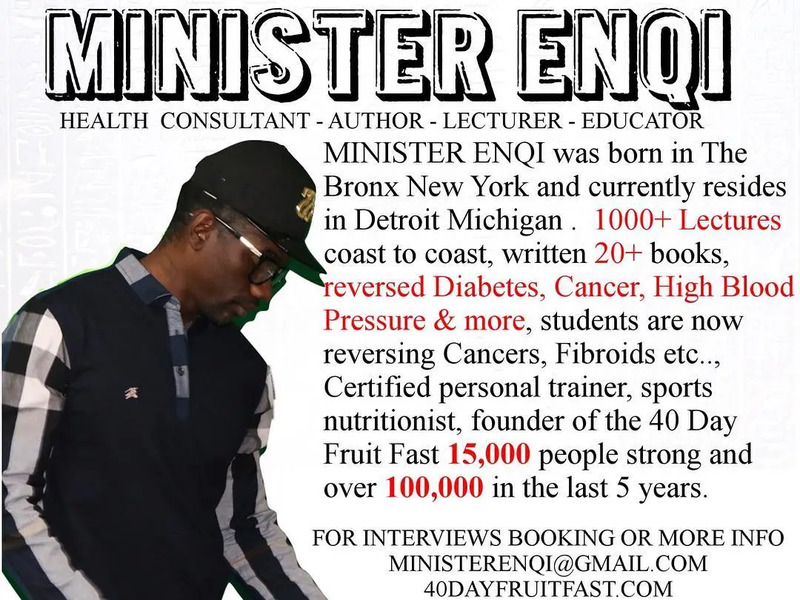 Meet Dr.EnQi Real, the founder of 40 day fruit fast, the man helping transform the lives of hundreds of thousands of people across the globe. The company raises awareness about better eating and the use of herbs for nutrition. People from every continent have participated in this fast. He teaches with a full staff of Health Professionals ranging from Biochemist to Personal Trainers in his LivingBioChemistry.com course anchored by his internationally appraised book Eat Right for Your Haplotype. Dr. EnQi Real, has been an author of over 30 books, he is famous by the name of Minister Enqi, as he is also an ordained minister. He received a Naturopathic Doctor Degree and finally changed his title from a minister to a Doctor. Dr. Enqi is the most sought after holistic healer, he is also a social media personality with mastery of the biochemistry pertaining to the transfer of nutrients into cells and waste removal out of cells. He has mystified the Instagram world by storm and created a flurry of copy cats and spin offs. On Instagram Dr.EnQi has over a quarter of a million followers where he speaks to the Urban Vegan Community and does his unique form of Social Media Comedy , which he uses as a bridge to speak to people about natural health. The company OneTone.Earth is all about detoxing, regenerating and INSPIRATION! The goal is to help people kick off the fast. To stay strong and maintain momentum by focusing on the little things that really matter for staying motivated. They believe that the right formula for success is different for everyone, but through their own trials and tribulations, they have found that focusing on the small stuff each day is really the best (and most realistic) way to make lasting change. They just recently created a hashtag challenge which is in the millions due to the power of his social media comedy as well as the Big Fellas of Comedy Tour he sponsored featuring and created by Haha Davis, J Will & Comedian Barry. The hashtag #mjvsenqidetoxchallenge was designed to bring the pure comedy audience to some boring nutrition science. It has been a success so far and is growing with every rising sun. On the coming January 18, they have a 88.1 FM radio show in Detroit and Jan 20th a TV 91 comcast/TV33 vegan social media comedy sketch show called InstaVeganTV & InstaVeganRadio. You may check his Instagram Page for some hilarious content and their regular activities. This family can be found in their Oakland County Michigan Gym/Cafe Daily teaching the community, or studying in their suburban home with a private river; which is an amazing place for meditation and creativity. Love is the skin of Light and Light is Life. That is their motto and creed. They put that Love and Light into their products and services which breeds Life into all who consume them. Dr. EnQi’s daughter Tone has created a variety of herbal supplements that have changed the world forever! The company claims that, “The herbs have helped reverse cancers, diabetes, heart conditions and much more.” They are all available on OneTone.Earth, yes dot Earth not dot com. Tone is the most successful of the 9 other kids, Dr EnQi has and quite frankly almost any teenaged kid. Being only 18-years-old and owning a potential multi million dollar company, Artist management company, as well as being a young singer that has already landed the lead track for the Soundtrack to the movie InstaVegan.